Since McGill teaching assistants (TAs) first organized collectively in 1974, we have struggled to guarantee that we are paid for all of the work that we do. Every gain we’ve made has had at least two notable consequences: it has lessened the burden faced by graduate students working as TAs so we are better able to study and conduct the research on which McGill prides itself, and it has supported the quality of instruction that undergraduate students receive. More than a year after our last collective agreement expired in June 2014, TAs at McGill are reaching the end of the bargaining process over a new contract. McGill’s administration made its final offer at the bargaining table on September 1, and TAs will be voting at the General Assembly for their union, AGSEM, on September 30 to determine whether to accept this offer or fight back by striking. 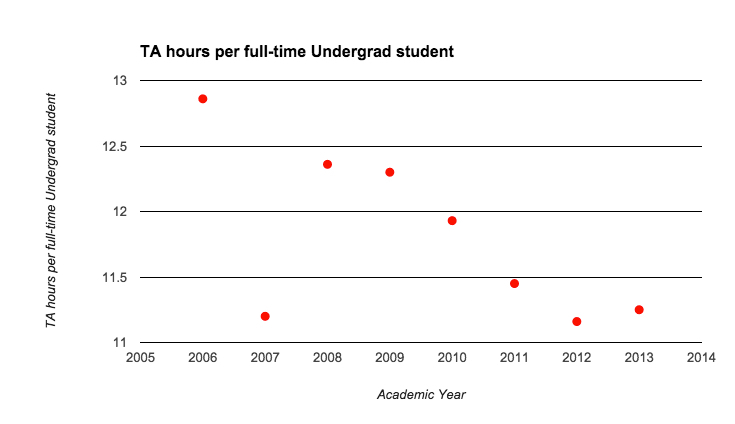 AGSEM’s primary goal in bargaining has been to keep TA hours consistent with undergraduate enrolment in order to maintain the quality of education at McGill. Essentially, we want to ensure that there are enough paid hours during which we can do the work that needs to be done. 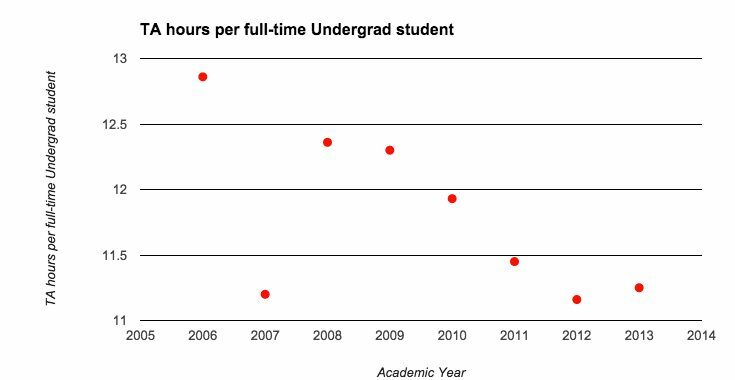 Over the past decade, the number of TA hours per undergraduate student at McGill has plunged significantly, from 12.86 in 2006 to 11.25 now, with the fraction of the operating budget dedicated to TA wages dwindling every year. 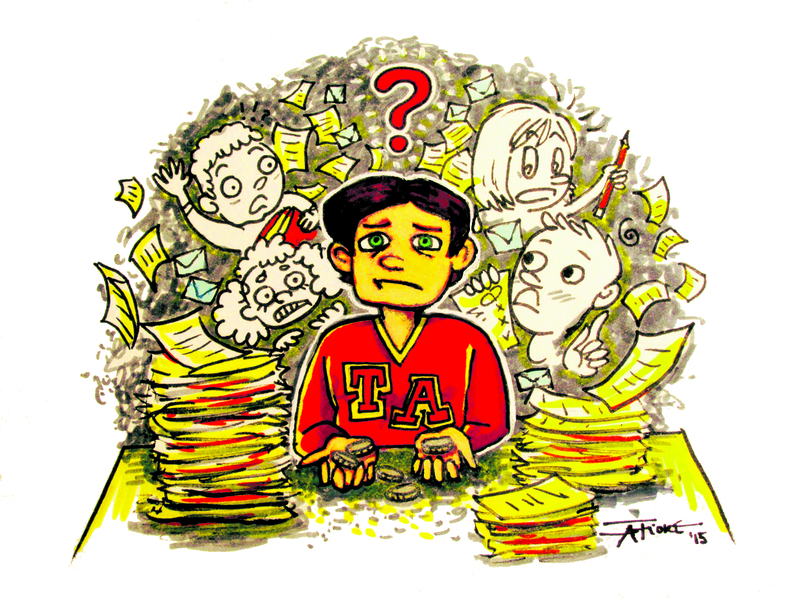 Skimping on funding for teaching support means that there are fewer and lower paid TA jobs for graduate students, many of whom are already struggling to make ends meet in programs with no guaranteed funding. It means that some of the work TAs would have done is picked up by professors at the expense of their other commitments, by overworked course lecturers with limited union protection and no job security, and by underpaid course graders. Mostly, however, it means that undergraduate students end up with more and more multiple choice tests, fewer office hours and opportunities for one-on-one or small group learning, and a less fulfilling education overall. McGill’s teaching assistants deserve – and desperately need – better working conditions. AGSEM’s bargaining demands include indexing TA hours to increasing undergraduate enrolment and guaranteeing sufficient TA funds in McGill’s budgets for faculties and departments (as deemed necessary by professors in those departments). AGSEM also wants to establish stricter limits on TA positions of fewer than 45 hours per semester, as these often lead to more work being offloaded onto grader positions that provide less educational support and pay much less per hour. These demands – intended to preserve both the quality of educational support at McGill and the ability of our fellow TAs to pay their tuition and rent – have been met with absolute refusal by the McGill’s senior administration, who declared the University was only willing to bargain regarding the hourly wage. Even on this front, the University’s offer is inadequate. The administration’s final offer to TAs would only increase wages by $200 to $250 per year (assuming a student manages to get 180-hour positions in both the fall and winter semesters). With stagnant wages, increasing costs of living, and a shrinking pool of TA hours, this proposal isn’t enough to meet the needs of TAs. Additionally, under this offer, out-of-province and international students, who make up roughly 45 per cent of McGill’s graduate student body and are particularly reliant on on-campus jobs, cannot even cover their tuition increases. TA conditions are set to get worse, not better, under this proposal. Although McGill’s administration claims to be short on funds, its words at the bargaining table make it clear that cost is not the barrier preventing it from meeting our demands. When discussing AGSEM’s demand that McGill partially reimburse TAs’ health insurance and tuition, as is standard at other universities, McGill’s negotiators stated that the University’s objection was a matter of principle, not of cost. Much the same can be said of McGill’s refusal to guarantee an adequate number of TA hours or an adequate budget line from which to pay us. The issue is not cost, which would be well within its means (the TA budget is currently about 1.1 per cent of McGill’s operating budget), but rather the administration’s refusal to set any sort of precedent that might commit them to prioritizing fair and equitable conditions for students and workers. On September 30, AGSEM members will vote on whether or not to accept McGill’s offer. As present and former members and elected officials of AGSEM, we know that McGill’s teaching assistants deserve – and desperately need – better working conditions. We also know that McGill’s administration concedes nothing without pressure. Although this is the final offer at the bargaining table, TAs still have a chance to fight for our university – by rejecting this offer and voting to strike. Consider some of the gains that workers have won from going on strike. First, every major gain McGill TAs have won has been due to a strike. And every time we have gone on strike, we have won something important: in 1976, a base salary and protections against overtime that set a precedent nationally; in 1998, a reduction in salary disparities across the university (TA salaries were completely equalized in 2006); and in 2008, after a two-month strike, the TA workload form that ensures that contract hours are equivalent to the amount of work required, as well as another significant pay increase. Second, teaching assistants at the University of Toronto won increases to the guaranteed minimum funding packages for graduate students when they went on strike this year. They had initially won guaranteed minimum funding by striking in 2000. This fall, students and workers across Quebec will be mobilizing against public funding cuts and increasing labour precarity. With other education sector workers also facing worsening working conditions, we will have opportunities for media exposure and solidarity actions with other workers. There is no better time to go on strike. Voting for McGill’s offer will lock TAs into another four or more years of struggling to secure jobs to pay the bills, working unpaid overtime, and neglecting our studies and research to get second or third jobs to make ends meet. It will mean years of hard-to-reverse changes to undergraduate education as courses are cancelled or modified to provide little to no feedback for students or contact with instructors. At AGSEM’s general assemblies over the past year, TAs have consistently demanded wages with which we can pay the bills and protections against declining TA hours. Our bargaining team did what it could to make those demands heard at the bargaining table. Now, it’s up to us to take a stand for ourselves, for future TAs, for current undergraduates, for the quality of education at McGill, and against the austerity mentality that is attacking education and public services across Canada. Negotiations at the bargaining table have come to an end. The only option left is to go on strike. In addition to the authors’ active involvement in AGSEM in the past five years, Benjamin Elgie (also former chair of the Daily Publications Society), Megan Mericle, Sunci Avlijas, and rosalind hampton have held elected positions on AGSEM’s executive. Mona Luxion is also a former Daily columnist. To contact the authors, please email m.luxion@gmail.com.